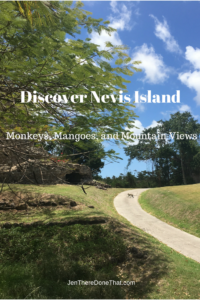 Nevis is the best-kept secret in the Caribbean for nature lovers, foodies, history buffs, adventurers, and anyone ready to trade in cramped city hustle & bustle for secluded paradise. Plus, there are monkeys. Located in the heart of the Caribbean, is the small country of St. Kitts and Nevis. While St. Kitts is a popular destination for cruise ships, Nevis island is a separate island state located directly to the south. Nevis is a secluded and upscale hidden getaway in plain view. This tropical island boasts more than just perfect weather, miles of beaches, breathtaking views of the Caribbean, and delicious rum drinks. 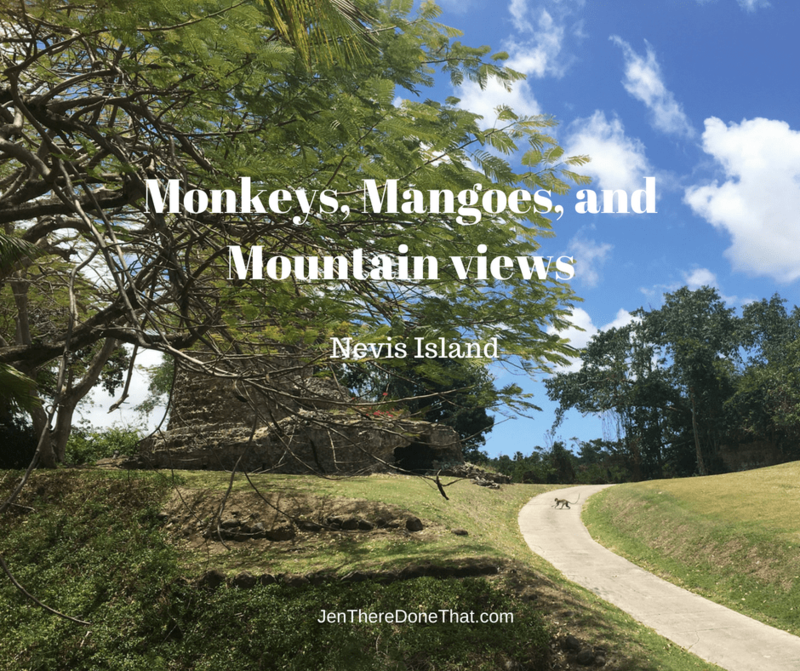 Here are a few of my favorite things about Nevis! The small local population of 11,000 residents on Nevis is rumored to be outnumbered by monkeys. African Green Vervet Monkeys roam wild throughout the island, exact numbers are a best guess and various tribes live throughout the island with the majority residing in the dense forest mountain slopes. 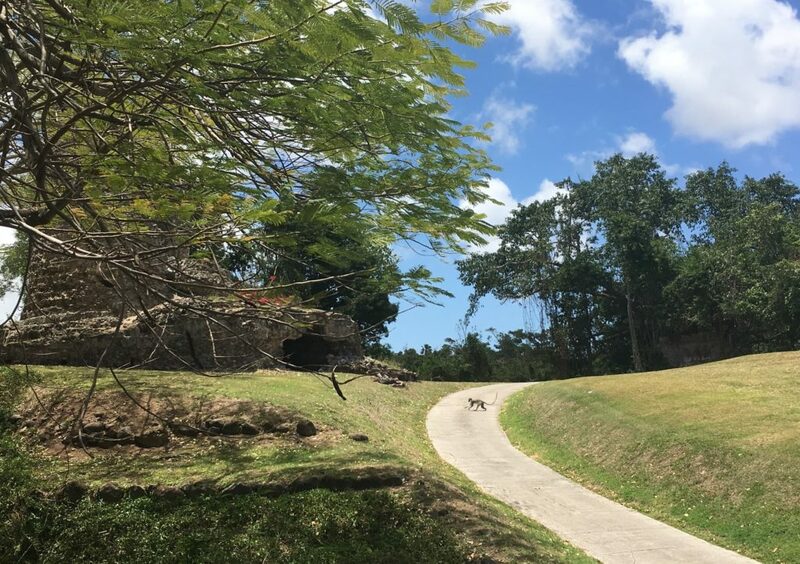 Originally brought to the island as pets in the 17th or 18th century, these monkeys now have free reign of the island and tend to get into a bit of mischief, as monkeys are prone to do. Early morning is the best time to catch a glimpse of these adorable long-tailed monkeys, about the size of a medium breed dog (up to 45 pounds). They love the local mangoes and fresh fruit from the residents’ gardens. Fruit is a big part of the diet on Nevis, for people and monkeys alike. With year-round perfect temperatures, fruit grows in abundance. 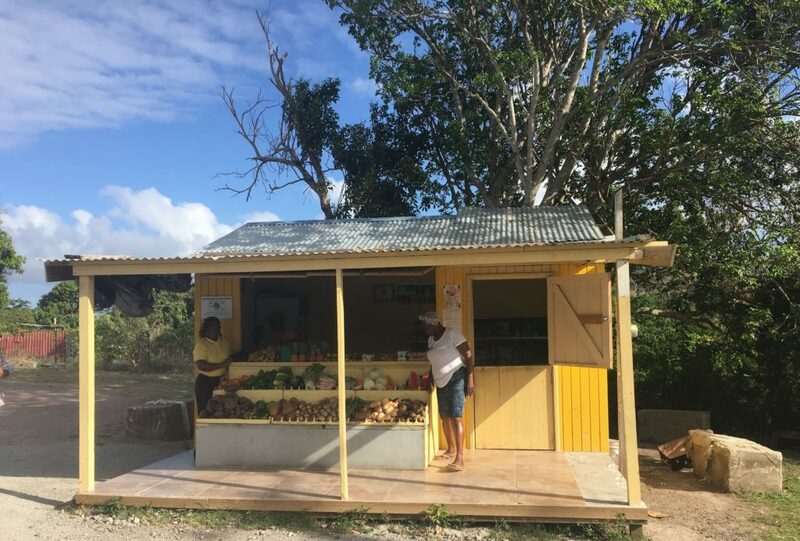 Some of the locally grown produce found at roadside fruit stands are coconuts, breadfruit, onions, tomatoes, cabbages, sweet potatoes, pineapples, watermelons, sweet peppers, squash, and of course, the most celebrated is the delicious mango. Nevis Island grows has over 40 varieties of mangos on the island, with distinct flavor profiles. The annual Mango & Food Festival in July features mangos in every course of every single dish! This is a mango lovers dream of mango chutneys, grilled mango, mango infused salad, mango slaw, and sauces galore. Cooking demonstrations, celebrity chefs, festival atmosphere with Nevis charm, the mango festival is a food lovers dream. I am definitely adding the Mango Festival to my travel wish list and plan to attend the culinary event. The most striking landmark is Nevis peak. Visible from any spot on the 36 square mile egg-shaped island, Nevis peak is known as Nuestra Senora de las Nieves translated as “Our Lady of the Snows”. 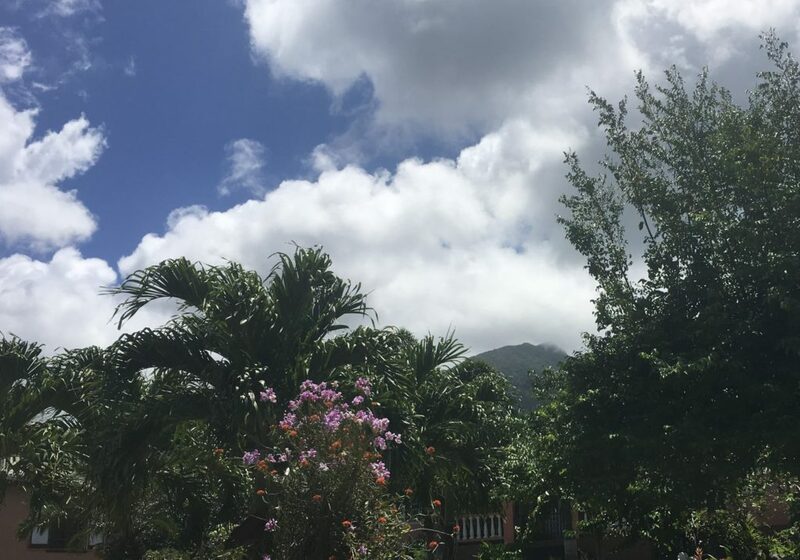 The thick white clouds billowing at the mountaintop resemble a snow-capped peak, and the Spanish word for snow Nieves was shorted to Nevis for the island name. 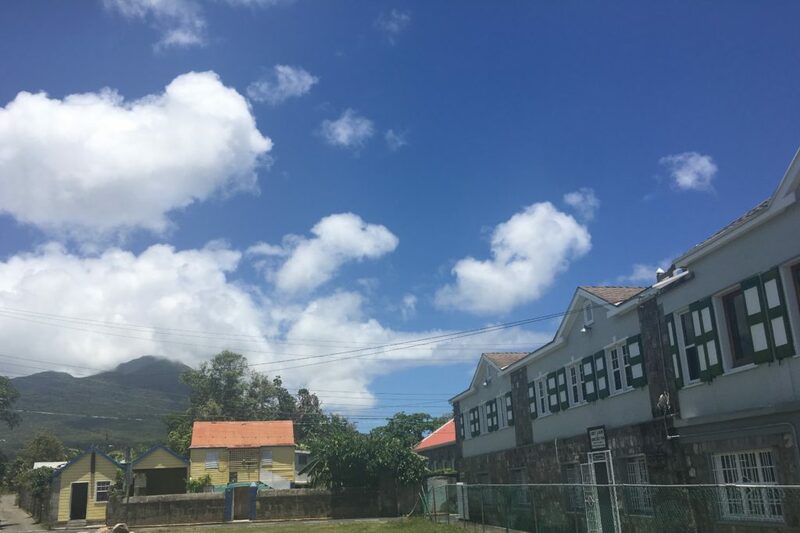 While many of the roads lack street signs, they are well maintained and easy to navigate, especially with Nevis peak visible everywhere on the island as a guiding landmark. Cars drive on the left side of the road (British style) and Taxis are abundant. I was quite jealous of the visitors exploring the island on bicycles! The island thrives with tourism as the top industry, without feeling like an over-commercialized tourist trap. A local bar owner also runs a part-time mechanic shop, and cooks an amazing “goat water” stew on Sundays. Businesses are family owned and operated, from the charming husband & wife team at Compassionate Hands Spa to the spunky Mother & Daughter duo at Yachtsman Grill, guests are quickly welcomed to the family. There are no chain restaurants or stop lights. There are plenty of Oceanfront restaurants, Mom & Pop operated businesses, secluded beaches, hidden hiking trails, free roaming donkeys, goats, horses, monkeys, and more. Disclaimer: Special thanks to the Nevis Tourism Authority for inviting me to visit as part of an all expenses paid familiarization tour of the island. As always, all opinions are my own. Have you explored Nevis? Leave a comment below for any additional tips or questions! Ahhh I’ve visited St Kitts but never Nevis Island! After your post I’m kind of kicking myself for not hoping on a boat and making my way over!! Those mountains are stunning and I love that it is less touristy! Hey, Nevis Island sounds fun. With water all around, hidden beaches, hiking trails, open restaurants, lots of fruits, especially mangoes (my favorite), and wildlife too, this is very close to a great holiday. Thanks for sharing. I’d never heard of Nevis before. It sounds great. All that fresh fruit has got my mouth watering. I love that they have a mango and fruit festival as well! Truely a hidden gem of an island. A week in this secluded island will definitely be a well deserved break from the hustle bustle of the city. No signals sounds like a very good option for me. I love mangoes, so I have got one more reason to visit Nevis Island. Nevis Island sounds like my ideal place for a holiday, I love adventure and the outdoors. I have not been to the Caribbean before but it is high on my list. Definitely keen to add this if it is near St. Kitts. You could split your holiday up and stay a few days on each island. . Cool picture too of the monkey walking around the road. Caribbean looks perfect for peaceful and relaxed holidays, surrounded with exotic nature. Mangoes and monkeys are very common sight in India, so I would surely love Nevis because of my favorite mango trees. Being a mango lover, I am adding this to my wish list. I’m glad there are still places that are not full of tourists. This looks like a beautiful island. I have dreamed about visiting Caribbean for a long time already since I have never been there, and there is so many awesome places to see there. Loving the monkeys! Nevis is one of my favorite Caribbean islands! You will love it. wow! looks beautiful! Plus monkeys and mangoes are 2 awesome things! How did you get there? Plane/boat? We are poss. moving to Puerto Rico soon, so this is definitely a must visit. Nevis is a short flight from San Juan, Puerto Rico. 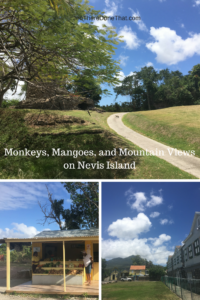 I am working on a Nevis planning post for full details, so stay tuned! I have neve heard of Nevis island before so I was reading your post with a huge interest! I am glad its not all about beautiful beaches! So much monkey and so many varities of mangoes! And I would love to visit Nevis while the Mango festival is being hold! I wonder though after I leave the island will I still be liking mangoes? I wish Bahamas is so near in the Philippines. I think this is another awesome place and worth visiting. Which part of Nevis island is your favorite? It is a tiny island, easy to drive around the entire island in a morning. I loved everything! How peaceful and serene Jen. Mangoes and monkeys? I am in! 2 of my fave things about the tropics. Brilliant. 40 different varieties of mango? That’s crazy! Mango is my favourite summer fruit. I am intrigued and I may need to time my trip to Nevis Island with its Mango & Food Festival! I wish I’d chosen Nevis over the Bahamas. We didn’t eat any fresh fruit (a real disappointment) and there were no monkeys either! It looks so pretty there, and if I ever return to the Caribbean, I’ll be sure to check out Nevis for an alternative. Nevis is one of my favorite islands in the Caribbean! Definitely add it to your travel plans. I have always wanted to visit St Kitts & Nevis but it is so far away from me! Nevis sounds glorious and I LOVE mangoes. I would go crazy at the mango festival and I use it a lot in my desserts and salads. The mountains look gorgeous too but too bad you can’t get up there! Nevis is beautiful and worth the long haul travel! Hikers can absolutely go up Nevis Peak, I just ran out of time this visit. Hiking Nevis Peak is top of my list for my next visit to Nevis. That looks very beautiful and inviting. So chilled… I like that it is not, as you say too crowded or too touristical. But best thing must be to see the monkeys there in nature. The Mango festival must be inspiring I assume for great new ideas of preparing that delicious fruit. I had no idea they were separate islands states, before going. Nevis is such an amazing island, and a short water taxi ride from St. Kitts. This is a beautiful part of the world where I would live to visit some day. The mountains and beaches are absolutely fabulous around this part. The monkeys add more life to it Thanks for sharing this. The visuals are great as well. So glad you enjoyed it! I hope that you can explore Nevis and the Caribbean soon. Holy cow, it looks so beautiful! Can you climb the mountains? In puerto rico they didn’t recommend it on many of the mountains- not because they’re volcanoes, but because they didn’t have much of a staff for finding anyone on a hike who needed aid.